Pasqualina “Pat” Squicciarini, 88, passed away surrounded by her family on Sunday, November 04th 2018, at her home in Somerset, NJ. Mrs. Squicciarini was born July 17, 1930 in Brooklyn, New York the daughter of Michele and Raffaela Bove. Pat raised her family in Brooklyn and in 1999 she relocated and settled in Somerset. Pat was a long time parishioner at St. Catherine of Alexandria Church in Brooklyn and St. Matthias Church in Somerset. She was a devoted homemaker and valued being the mother to her four children. Most of all she cherished being a grandmother to all nine of her grandchildren. Pat was also an amazing cook and baker. Mrs. Squicciarini was preceded in death by her husband in 2014, Nicholas Squicciarini, her parents, Michele and Raffaela Bove and her brothers, Dominic and Gaetano Bove. 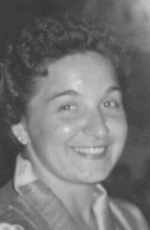 She is survived by her sons, Gaetano "Guy" Squicciarini, Ralph Squicciarini and his wife Christina, Michael Squicciarini and his wife Therese; her daughter, Angela Incorvaia and her husband James; her sister, Michelina Cossell; her grandchildren, Nicholas, Michael, and Daniel Squicciarini; Jacqueline, Joseph, and Nicholas Incorvaia; Mia, Sofia, and Joseph Squicciarini and a host of nieces and nephews and great nieces and nephews. A Mass of Christian Burial will be held at St. Matthias Church in Somerset on Wednesday, November 7th at 10:30 A.M. Burial will follow at Resurrection Cemetery in Piscataway. In lieu of flowers, please consider donations in Mrs. Pasqualina Squicciarini’s name to the American Lung Association, https://action.lung.org/site/Donation.